Peter arrived to Fairbanks and reunited with Janos. He also was able to call home, first time since he left Deadhorse Airport 10 days ago. Peter is completely exhausted. He says the Dalton Highway was much harder, physically and mentally, than what anything he had ever experienced, including the entire 2012 Cross-Country trip. He will take a few days rest in Fairbanks, to rehydrate, to build himself back up nutritionally, waiting for the swelling on his knee and both feet to subside. Click on Progress Map in the top menu. Peter successfully finished the Dalton Highway, which was by far the hardest part of their trip. He has another day or two to arrive to Fairbanks. Someone who had rode the Dalton (both ways) on a motorcycle, and he said it wasn’t easy. He saw some cars(!) proudly displaying an “I Survived the Dalton” buyer sticker… This put Peter’s ride into a new perspective, especially since he accomplished most of it alone. 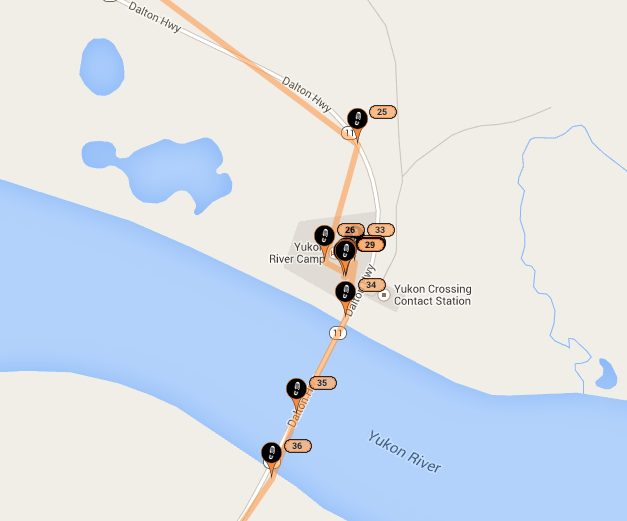 From the Yukon River to Fairbanks, Peter’s ride will be pretty hard. In just 126 miles he will have to ascend a total of 12.5 thousand feet. The fact that he will descend just as much doesn’t make the inclines any easier. This will be the hardest part of the Dalton Highway, and Janos confirmed that the most exhausting tracks are when the road goes up-and-down, up-and-down seemingly never ending. 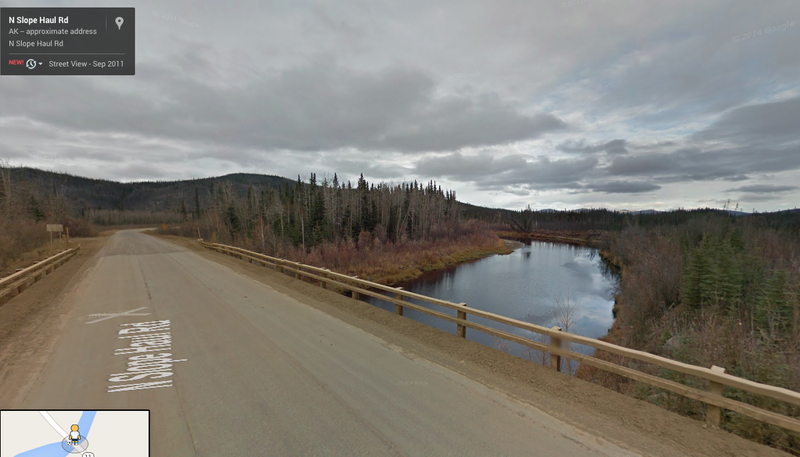 You can see a Google Street View image of the Hess River Peter just passed, and below that the cross-section of Peter’s track until he gets to Fairbanks. Originally he planned to be there by Sunday or Monday. Now we estimate that he would arrive on Tuesday. 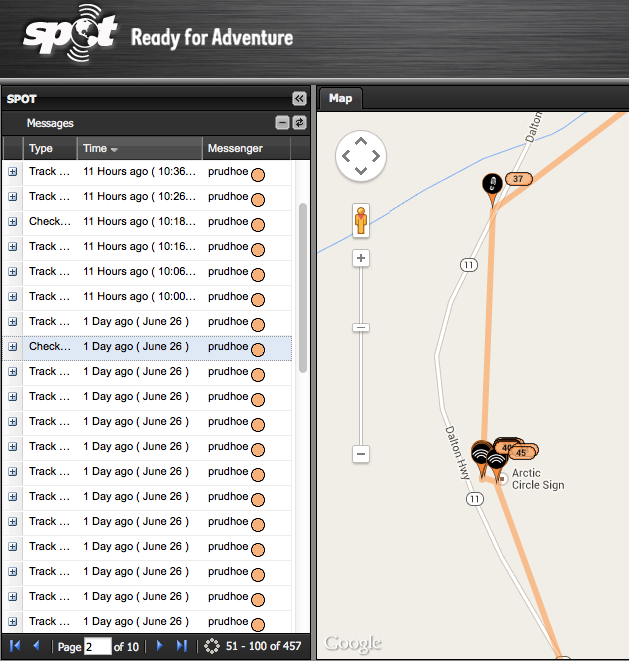 Peter (or his GPS) played tricks on us today. At 8 pm there were no track messages coming so we thought he turned off the device and called it a day. We wrote a blog entry about the difficult terrain (see the left part of the figure below) and how he only accomplished 37 miles. We even found a not too interesting sight he passed (Finger Mountain) and gathered information from Wikipedia, just to be able to write about something. At 9:30 pm his Spot started sending messages again, form a location further south. Peter was still on the road, and (as we saw first thing in the morning) did not stop until he reached the Yukon river at 2 am. Another milestone of his trip. 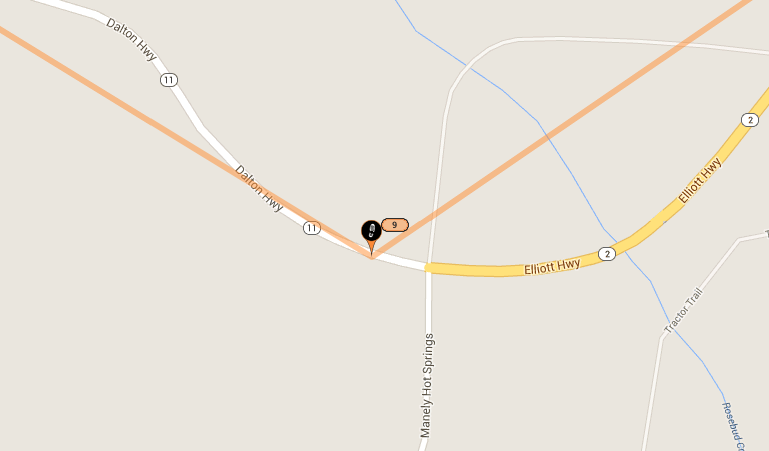 Now he is 126 miles away from Fairbanks where he will reunite with Janos. Below you can see how the road inclined for the first part of the day, then how it declined as getting closer to the river. The screen shot on the right was taken in the morning after Peter crossed the Yukon. We still date the post as 6-27-2014. Today Peter ascended a total of 3,600 feet and descended just as much, to arrive to the same elevation he started at. But what is much more important, tonight he arrived to the ARCTIC CIRCLE! We bet he took a couple of selfies and we cannot wait to see them. On the map below you can see the track he accomplished so far, starting at Deadhorse, riding the dirt road named the Dalton Highway. Just a reminder: Peter and Janos’ goal with this trip is to raise funds and visibility to the Blind Judo Foundation. Please visit the Foundation’s website by clicking on the tab in the top menu, or here. Today must have been a happy day for Peter. He rode mostly downhill. Of course, this was a payback for some hard work done in the previous days. He must be having fun, except that (according to the weather forecast) it should be raining all day for three days. For the first time since Deadhorse, Coldfoot offers a lot of things that remind the traveler of civilization. After 239 miles, this is the first place where food, lodging and a post office are available. It is also the first place that offers gas and a tow truck for those who use such things. 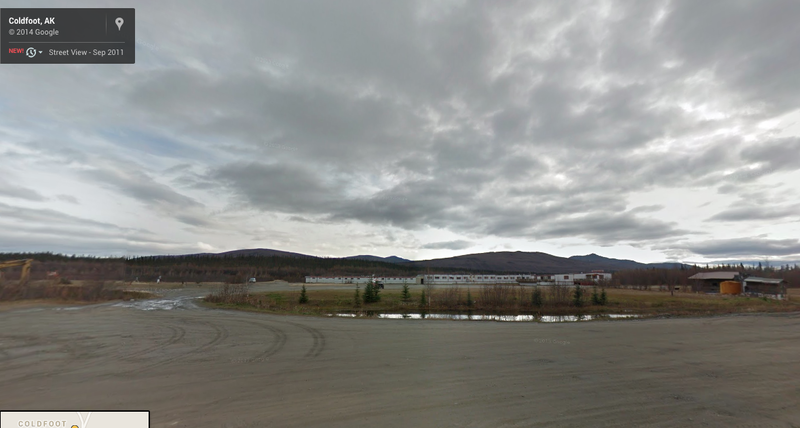 On the picture below, Coldfoot Campground with the hotel. Peter is only 60 miles from the Arctic Circle!